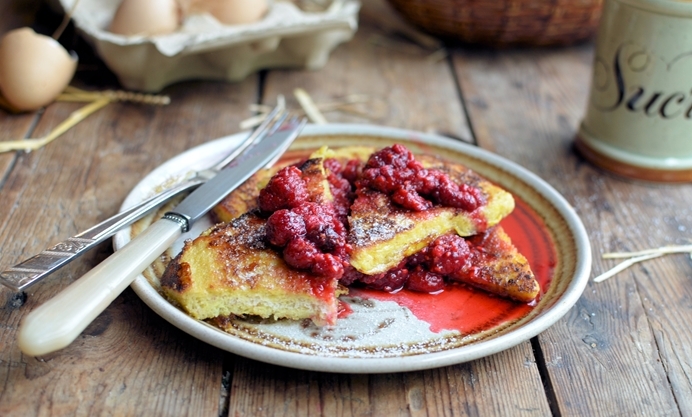 Karen Burns-Booth dishes up a magnificent breakfast - French toast with a vanilla raspberry compote. French Toast comes in many guises, and is also known as “Eggy Bread”, “Gypsy Toast”, “Omelette Bread”, “Pain Perdu”, “Poor Knights of Windsor” as well as “Pain Doré”; they are all one and the same in so far as bread, usually stale, is soaked in an egg and milk mixture (sometimes with alcohol added, as in Poor Knights of Windsor) which is then fried until puffed up and a crisp golden brown. The “toast” is then served with jam, fruit, honey or maple syrup for a sweet and indulgent breakfast. Other variations are “Egg in a Basket” and “Eggs in a Nest”, which is a classic WW2 recipe, where one egg serves more than one person to make the most of wartime egg rationing. Whatever the name or recipe, if you have eggs (as well as bread) and are tired of the usual way eggs are served, then this is the recipe for you. If cooking for a crowd, fry the bread in batches and keep them warm in a hot oven wrapped in foil to stop them drying out, and you have the makings of a very special breakfast or brunch for friends and family. I hope you all enjoy British Egg Week, and do try this simple recipe if you fancy your eggs a different way…….you can make the egg and milk “batter” up the night before, as well as the raspberry compote, which will cut back on time the next morning. 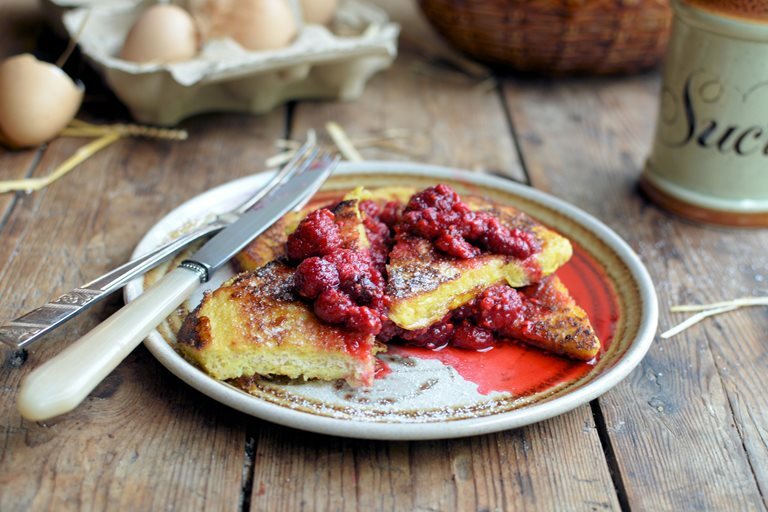 If jam is your favourite accompaniment, then there is a lovely Raspberry and Vanilla Jam on Great British Chefs that would also be a fabulous way to serve this French Toast.